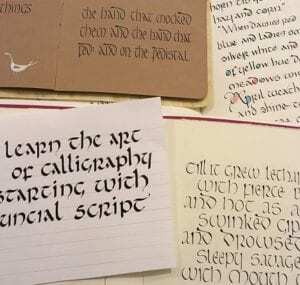 Just starting out in calligraphy or have a bit of experience? Come and develop your skills as a member of the Birmingham Scribes at the Pen Museum. The Scribes have regular meetings throughout the year at the Pen Museum and the group’s main aim is to promote the art of calligraphy. As a member you will be able to attend these meetings, some of which will be workshops led by an experienced calligrapher and others will be more self-help styled. At least once a year, members will be invited to take part in an organised exhibition of their work which will be on display at the Pen Museum. Initial membership will be £15. 00 per year with a meeting fee of £5.00 for self-help events and up to £20.00 for tutor led events. Come along to the Pen Museum and be a part of this exciting new group! For this session, please bring your basic calligraphy equipment (for beginners we have some you can borrow). You can do your own projects or take part in the day’s theme which will be trying different types of backgrounds that you can use for your calligraphy. No need to reserve a place, just turn up and pay on the day.